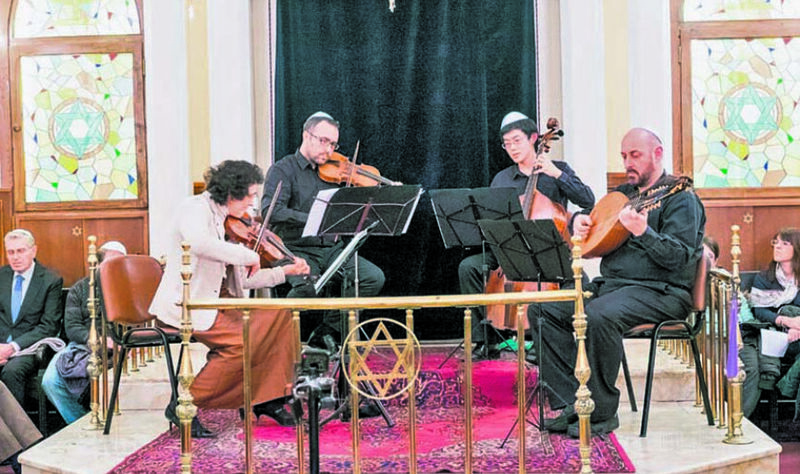 On February 3rd, 2019, Italian Jewish Community in partnership with Italian Cultural Center organized a concert on the occasion of ‘January 27th International Holocaust Remembrance Day’, at the Italian Synagogue. From Italy came Ensemble Salomone Rossi for this event. Ensemble Salomone Rossi is an ensemble that has given many concerts in Italy and other countries as well as performances on various national and local radio stations. Before the concert began, Italian Jewish Community Leader Rifat Behar and Italy’s Consul General in Istanbul Elena Sgrabi gave short speeches where they both emphasized the importance of the event. The repertoire consisted of unique tunes from 1600’s and 1700’s. The guests had the privilege of listening to exclusive music from one of the widely acclaimed ensembles in Europe. “Anne Frank – A History for Today” exhibition was opened in Mersin Yenişehir Municipality Atatürk Cultural Center, on April 19th Friday. The court sentenced one of the defendants in the provocation against Neve Salom Synagogue case to one-year imprisonment. Two years ago, a group of agitators had gathered in front of Neve Salom Synagogue’s gate for a provocative demonstration. Lara Arditi, an 11th grader in Hisar Schools, developed a project named “Art on the Fishing Rod”. The aim of this project is to solve the pollution problem in the seas and help save the endangered marine wildlife. Ever since it was reopened, every year during the Foundation Week, the Grand Synagogue of Edirne housed a great exhibition and a concert. This year on April 28th Edirne Synagogue is welcoming the diva of Latin and Sephardic music, Flamenco, Tango and Fados, Yasmin Levy for a concert. U.S. Consul General of İstanbul, Jennifer L. Davis, took a touristic trip to Edirne. Davis, after a tour to the Old Mosque, visited the Grand Synagogue of Edirne. The attacker who threw a petrol bomb to Izmir Beth Israel Synagogue a few days ago is captured by the police. The exhibition “Edirne and Armenian Community” displaying the old photos and postcards of the Armenians living in Edirne, was opened on March 24th in the Culture and Art Center of the Grand Synagogue of Edirne. CHP’s Istanbul mayoral candidate Ekrem Imamoğlu, visited Isak Haleva, the Chief Rabbi of Turkey, at the chief rabbinate. In his visit CHP Istanbul deputy, Aykut Erdoğdu also accompanied him. Izmir Bet Israel Synagogue hosted an interesting and highly academic concert featuring soprano Linet Saul, mezzo soprano Lori Sen, pianist Jerfi Aji and Linet & Moris Saul’s daughter Kamilla.